When I entered a cake competition for the Cake & Bake Show in London, it was with the zero expectation that I would get through. So when I was informed that my submission had been shortlisted, I could not believe my luck. Entrants get the added bonus of free entry for the whole three-day event, as well as ten complimentary tickets to give to friends and family. I gave half of these away, including one for my dad, so we could go together. The theme for last year's competition was Children's Stories, so I made a Mr McGregor's Chocolate Carrot Cake Garden. Getting it all they way to Excel London on the tube during rush hour was no easy feat, but I finally made it. I was taken through to the exhibition space, where other entrants were also setting up. My one hope was that my cake would not be an embarrassment compared to all the others. Unfortunately my wish was not granted, because although I had entered the amateur competition, most on display were done to a professional standard. Despite this, I enjoyed seeing all the other bakes, and was in awe at the masterpieces people had created, and wondered just how they did it. I found my answer when I came across a stall called CakeFrame, which make cake stands that allow you to assemble around cake around it. This made me feel better, because apart from the lollipop sticks, my cake was entirely edible. The other monumental bakes were probably being propped up by some kind of skeleton structure on the inside. As well as a cake competition, there was a competition for the best bake as well. This category included bread, biscuits, tray bakes, desserts, etc. I think I would have stood a better chance in this one, as I am better at flavours than I am presentation. After I had finished, I was instructed to go back outside and wait for the official start time at 10am. The grand opening was made by a host of guest celebrities who cut the ribbon to let us all in. Everyone was offered a show guide with a goodie bag, but I didn't bother as I can manage to work things out for myself quite adequately without forking over a fiver. The first thing to do is gather your bearings – make sure you know where all the demonstration areas are, so you can get there in time for whatever you want to attend, Most demonstrations are free, but there are a few classes which you can book beforehand for £6. The first demonstration I wanted to go to was by Dr Oetker. The company was holding a number of talks throughout the day about how to use their products effectively. This included lessons in icing, chocolate, flavours, and food colouring. After the speaker gives a demonstration, you then get to have a go at decorating cakes and biscuits for yourself. What's even better is that they allow you to take home their products afterwards. I came away with a number of icing and colours gels. I tried to get into all of the classes, but the queues were so long, I only got into half. If you want to go to a free class then I recommend queuing early. My favourite demonstration area was the one dedicated to contestants from the Great British Bake Off. Series 5 winner, Nancy Birtwhistle, showed us how to make tiger bread, a bread I have always wanted to know how to do. 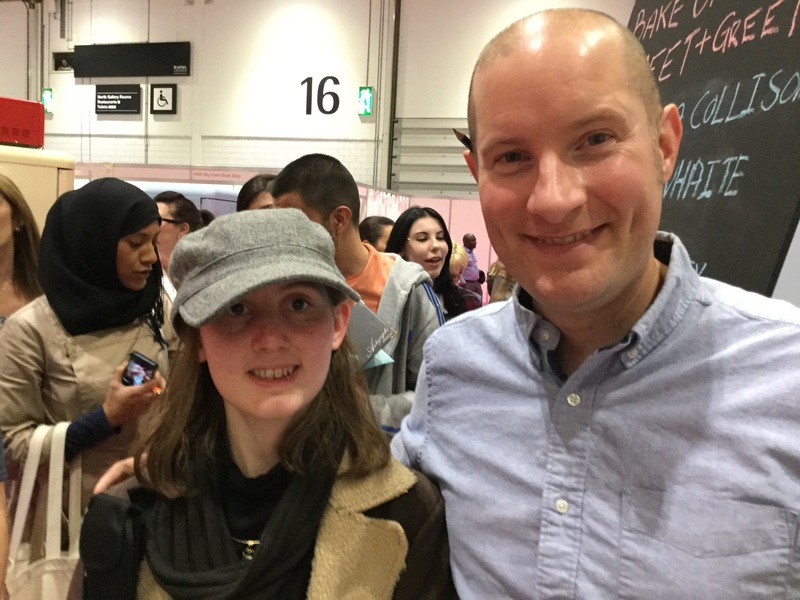 I also saw Jo Wheatley, John Whaite, Martha Collison, and Richard Burr, who were all doing book signings. The signings were a bit haphazard, as there was no queue and they didn't have a pen. Everyone just crowded round and were borrowing pens from one another. While you are not watching demonstrations, there are tons of stalls to see. It's really worth checking out each one, because many hold free prize draws, in which you could win fantastic gifts, from hampers to state of the art cooking equipment. There is something for every type of baker, whether you make cakes, biscuits, or bread. While some stalls are selling ingredients, such as flour, edible glitter, icing sugar, etc., others provide all sorts of nifty gadgets. I bought a peeler that was tough enough to take the skin off a pineapple and turn carrots into spaghetti. There was also a manual whisk that could turn skimmed milk into cream in ten seconds. If you don't have the baking bug, but are still a foodie enthusiast you'll can enjoy lots of edible delights: fudge, brownies, truffles, marshmallows, cookies, ice cream, the list goes on. But man cannot live on cake alone, so once you feel you've had a sugar overdose, why not try some fresh olives, sausage rolls, hog roast, duck wraps, and delicious bread? Oliver's Bakerywho had a magnificent display of ginormous loaves. From them, I bought a quarter loaf of black mountain rye and spelt bread. The spelt bread went perfectly with the passion fruit curd that I bought from the Wooden Spoon Preserving Company. Established over forty years ago, the company makes everything by hand in small batches. I also tested some of the preserves by Arapina, a Greek family business who work with the seasons. They have an incredible range that includes wild figs, bergamot, walnut, orange peel, kumquat, and more. While I was listening to a demonstration, my dad spotted flatbreads of some description being fried by Shana, They describe themselves as 'pioneers and market leaders of frozen exotic vegetables, authentic snacks and traditional South Asian flatbreads'. They were cooking paratha, an unleavened Indian bread that translates to mean 'layers of cooked dough. Although puffed up at first, but the cooks kept patting them down until they became crispy and wafer-like. Dad tried a cinnamon flavoured one for his lunch, and seemed to enjoy it. With all the amazing cake displays, you might think they were the biggest visual feature of the show, but what really took centre stage was a big red London bus in the middle of the exhibition. The BB Bus Tour is the road equivalent of the Orient Express, as they combine afternoon tea with a sight seeing trip around London. The Cake & Bake Show is not restricted to London; this year will see two more events taking place in Edinburgh (30th Oct – 1st November) and Manchester (12th-15th November). Tickets are £15 for adults and £14 seniors, and free for under 16s, but if you sign up to their mailing list, then they periodically send offers, such as two for one. If you want to challenge yourself, there is still time to enter the cake and bake competitions. Who knows, maybe you'll be shortlisted and get free tickets. Congratulations on your win Bryony :) I can't imagine how difficult it must have been to get your Mr McGregor's cake to the show in one piece taking the tube in rush hour!